I started by die cutting several butterflies in white card, there are nine in this strip. Using an odd number, ensures that there is one in the middle with an equal number on each side. 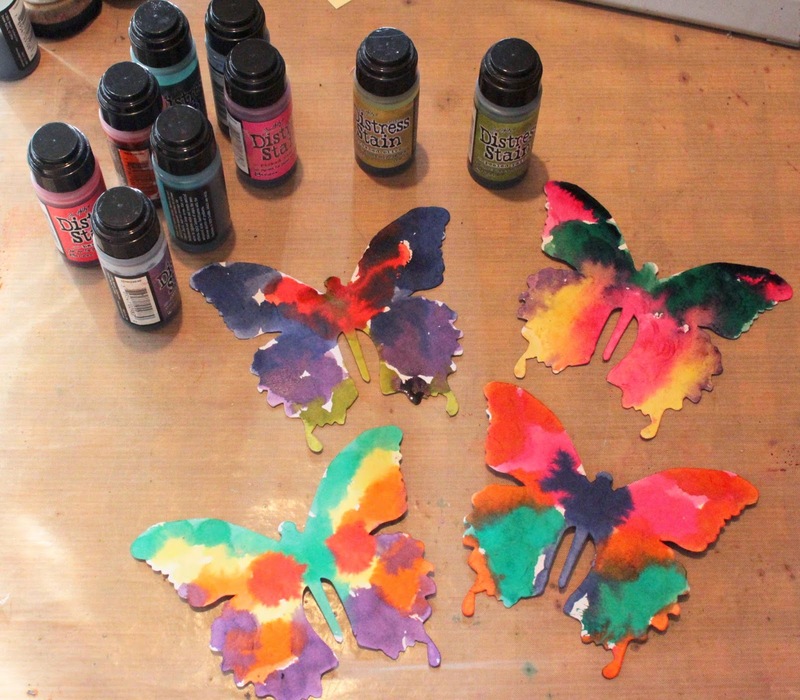 I splattered each die cut, with various colours of Distress Stain. I kind of stuck roughly to symmetrical splattering, as the idea of butterflies having symmetrical patterns on their wings, is something that was imprinted on my mind in my earliest schooldays! closed it up and ran it through my Big Shot embossing machine. 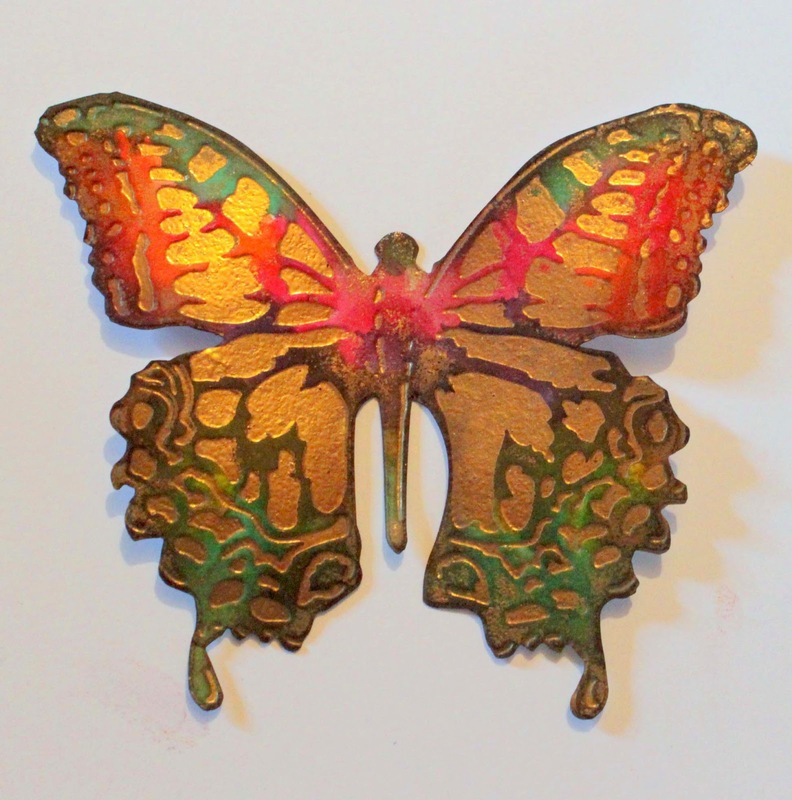 After removing the butterfly, I sprinkled on the gold embossing powder and heated with my heat tool. The embossing powder sticks to the deep embossed spaces where the Versa Mark ink was pressed into the surface from the embossing folder. Don't worry if some ends up on the raised patterns you can remove it with a small dry paintbrush, or leave it for added texture. which gave a slightly different effect. I lightly applied Vintage Photo Distress Ink with a blending tool, over the surface, to just take the edge off the brightness of the colours. I also used a touch of Black Soot Distress Ink around the edges. In order to string the butterflies together, I punched a hole in the top of each wing and attached a brass rivet using a Crop-A-Dile tool. I dyed some lengths of white seam binding with Distress stains, and used short pieces to tie each butterfly together. This is soooo pretty! 9 butterflies at a stretch...amazing! definitely trying the versamark on embossing folder. Genius idea! This is gorgeous. Toni, this is stunning! The multi-coloured butterflies are gorgeous in themselves and then when you add the gold embossing and the dyed seam binding...outstanding. Didn't think I needed this die but you and Sue have changed my mind...lol. this is really beautiful Toni! Just spectacular, Toni and what a FABULOUS idea! 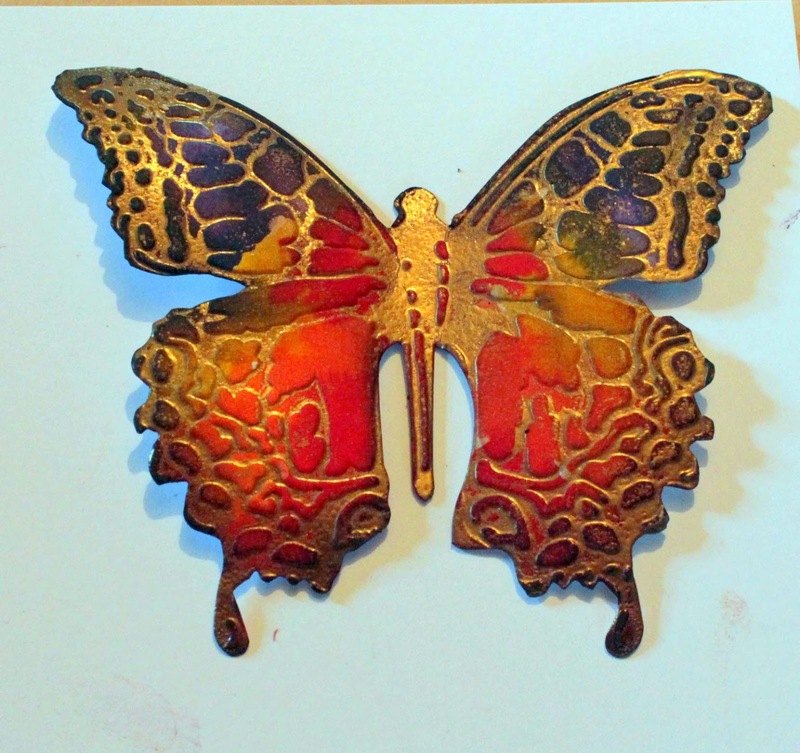 I just got this butterfly die and can't wait to play! FAB colors on each and every one! Wow, oh wow, Toni! This is absolutely spectacular! LOVE it! Wow Toni! what a marvelous project - I can't believe how many butterflies you colored and embossed - they look so pretty with the gold and bright colors! 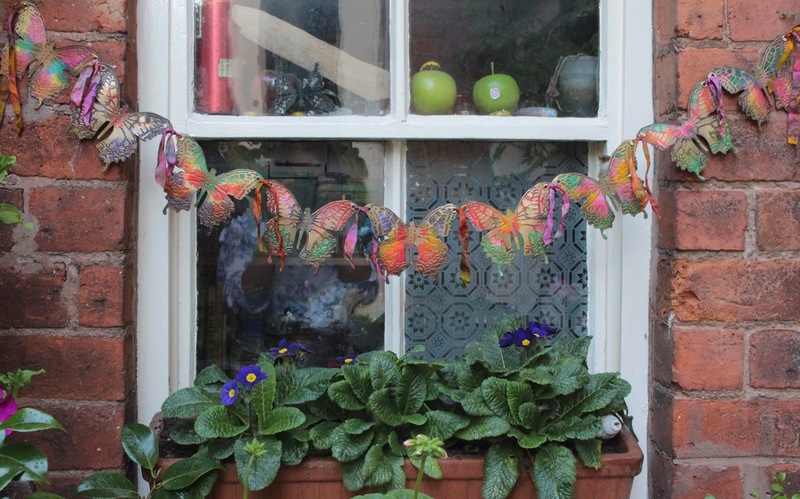 and the connecting ribbons hanging down add lovely texture to your pretty hanging! So colorful and cheerful! I love that you tried the embossing ink on both sides of the folder and how different it looks! I now definitely have to add this set to my collection! Thanks for sharing! I was sent over by a friend to have a look - wow! What a creative and beautiful project. This is such an outstanding project! The colors you used really put it over the top as well as the ample ribbons that tie it together. I love seeing it strung outside with all the greenery. So glad I happened to see it!